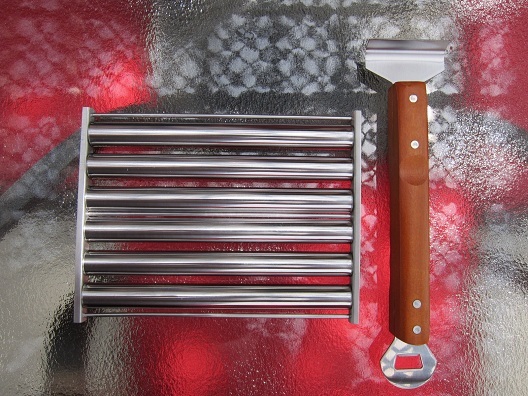 For this week’s review I was sent the Mr. Bar-B-Q Stainless Steel Hot Dog Roller from Karen Behrman at Mr. Bar-B-Q. 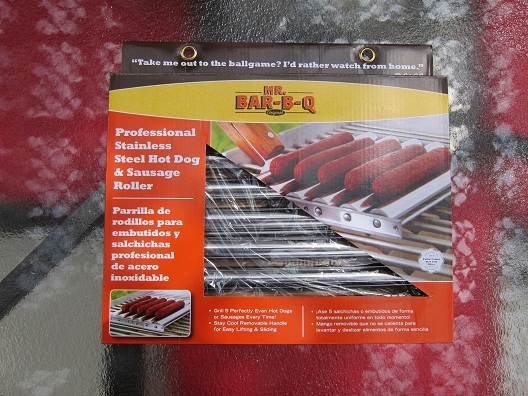 Mr. Bar-B-Q is an international importer and distributor of high quality BBQ tools, accessories and parts. 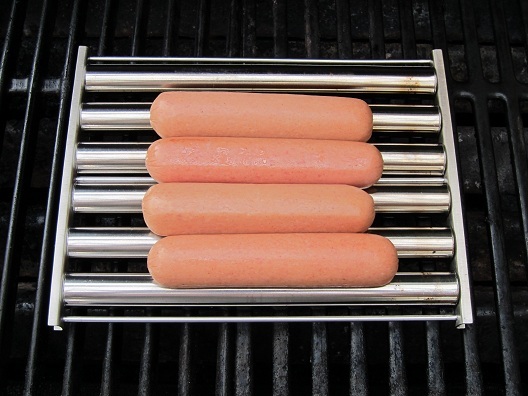 The Mr. Bar-B-Q Stainless Steel Hot Dog Roller is made of commercial grade stainless steel and allows you to grill up to 5 hot dogs at once. A stay cool removable handle that works both as a roller and a lifter is also included. 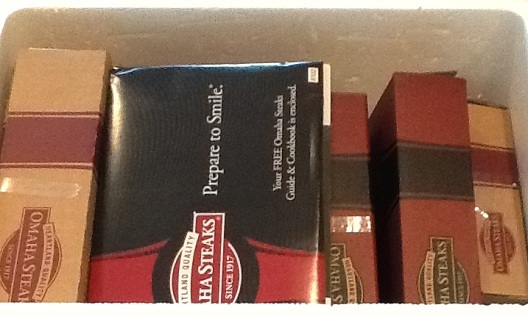 For this review I had some Omaha Steaks Gourmet Franks that my friend and owner of BBQ Sauce Reviews, Brian Henderson, had sent to me for my birthday. Thanks again for that awesome package, Brian! 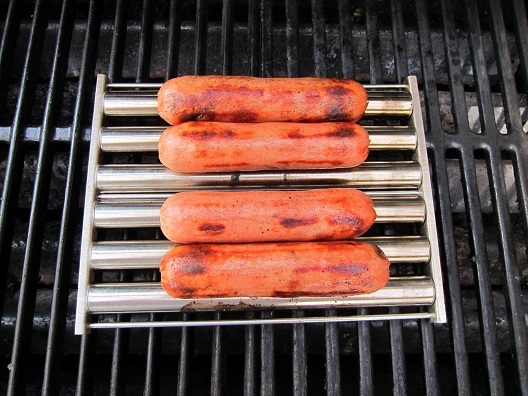 Once my grill was preheated I placed the hot dogs on the roller and then set the roller on the grill. Then, as I grilled the hot dogs I used the removable handle to roll the unit forward and backwards to turn the rollers in order to cook the hot dogs evenly. I repeated this process for the remainder of the cook. 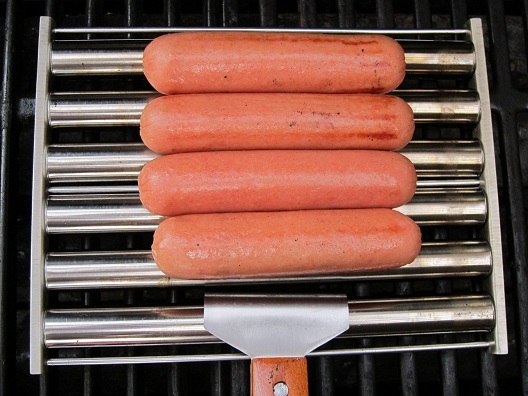 Once the hot dogs were finished cooking I removed them from the grill and brought them inside to eat. 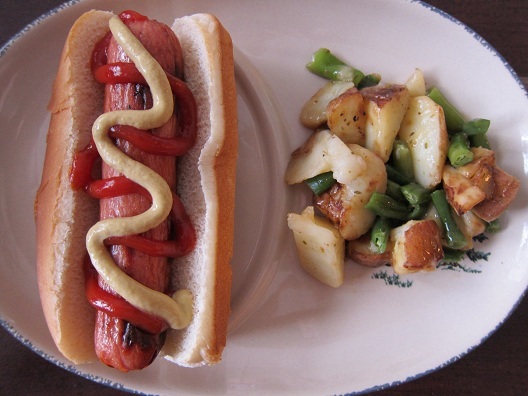 I really enjoyed using the Mr. Bar-B-Q Stainless Steel Hot Dog Roller. While using this product it brought back wonderful childhood memories of riding along with my dad to our local UDF (United Dairy Farmers) for a hand-scooped milkshake and a hot dog from the hot dog rollers they had in the store. This might be a product that you feel like you don’t need, but it’s one of those products that’s fun to use! I will be using mine a lot on game days while I’m watching my favorite baseball team play on TV. Plus at around $17 it’s a minimal expense to pay for a well-made easy to clean product that allows hot dogs to roll simultaneously so that each hot dog is cooked perfectly even each and every time. For more information on this product visit their Facebook & Twitter pages as well as their Website. Thanks Chris! That would be pretty cool if it did that! Thanks for leaving a comment man! Damn Jay, these hot dogs look great !! Thanks Nick! That last pic was my little girl’s hot dog…she loved it! Thanks for leaving a comment! Glad you liked the dogs Jay, I knew you’d put them to good use! Great pics too, man! Thanks man! Wait till you see the pics of the steaks in my next review 🙂 They were some awesome steaks too! Thanks again! Looks like a new toy!! !